Dr. Mori has conducted research on HIV and SIV in Germany and the USA. At the National Institute of Infectious Diseases (Japan), he has been studying the pathogenesis of HIV infection and protective immunity against HIV by SIV rhesus macaque models for AIDS. His group discovered that a quintuple deglycosylation mutant exhibited live-attenuated vaccine properties, demonstrating that glycosylation defines the pathogenic properties of SIV. Presently his group is focusing on achieving a better understanding of the role of viral glycosylation in innate responses to SIV/HIV in order to elucidate the containment mechanism of HIV infection and facilitate the development of novel therapeutics that aim to cure HIV infection. The development of several potent antiretroviral drugs has dramatically improved the efficacy of therapies for HIV-infected patients. Combination therapy using such drugs (cART) has enabled the lowering of HIV levels in blood to below detection limits. However, HIV proviral DNAs are integrated into the host genome of reservoirs, and viral replications relapse once cART is discontinued. Thus, therapies to eradicate infectious HIV or elicit protective immune responses capable of leading to functional cure are urgent issues in HIV research1. At the same time, in the field of immunology, elucidation of host defense against pathogens during the early stages of infections or innate immunity has become the main issue2. Thus far most HIV studies have focused on the adaptive immune response, humoral and cellular responses against HIV that are elicited several weeks after onset of infection. 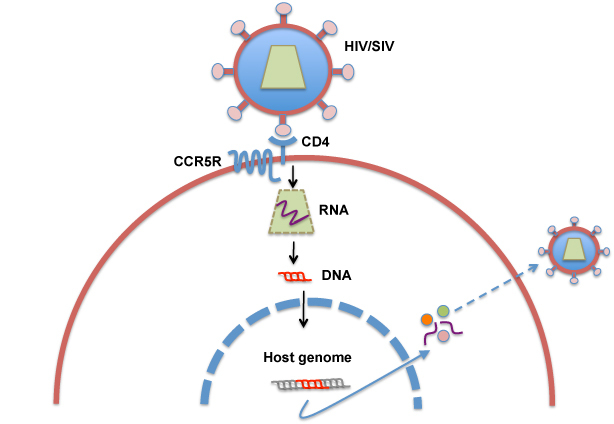 However, HIV is capable of escaping these host responses because of high diversity and variability of the viral genome due to an error-prone reverse transcriptase. In addition, HIV-infected individuals are generally not capable of eliciting antibodies against HIV that control HIV infection. Furthermore, HIV utilizes the host immune response to facilitate HIV replication. It is significant that these properties have been shown rely on viral glycosylation. I describe below the important roles and functions of glycosylation in determining the properties of HIV and SIV associated with the pathogenesis. HIV/SIV belong to the primate lentivirus of the retroviridae family that has the RNA genome and primarily infects CD4+ T cells. Infection of HIV/SIV begins with contact with the cells mediated by binding of the viral spikes (Env) to CD4 and the chemokine receptor (CCR5 or CXCR4) expressed on the surface of CD4+ T cells (Fig. 1). The binding of viral spikes to CCR5 induces fusion of the viral membrane with the cellular membrane, allowing entry of the viral capsid into the cytoplasm. Subsequently, the viral RNA genome is reverse-transcribed into the double strand DNA that is transported to the nucleus where viral DNA is integrated into the host genome. Viral genes are expressed as cellular genes: the transcripts are transported into the cytoplasm and translated into viral proteins. The viral proteins and viral RNA genomes are transported to the cellular membrane and form viral particles that bud out from the cell. Hosts recognize microbes as non-self by the immune system and defend themselves from microbial infections. Innate immune cells recognize microbes by sensing molecular patterns shared by pathogens known as pathogen-associated molecular patterns by pattern recognition receptors, that directs expression of interferons, cytokines, and chemokines, so that mobilizing many kinds of immune cells to sites of infections to kill infectious microbes3. In addition, innate immune responses play a critical role to facilitate for induction of adaptive immune responses. Adaptive immune responses elicit antigen specific T cells and B cells to recognize structures and/or protein sequences of microbes following the infection. Thus, the adaptive immunity primarily functions to remove the pathogens or the infected cells and protect from the re-infection. In the majority of infected individuals, HIV infections are not naturally controlled. However, in approximately 1% of cases, HIV infections have been controlled over a long period of time without any manifestation of HIV-1 infection-related symptoms. These are categorized as elite controllers and studied to elucidate the immune responses that distinguish the elite controllers from the majority of disease progressors4. Adaptive immune responses have been studied extensively to identify the immune response associated with the suppression of HIV infection. These studies showed that MHC alleles in a minor population were associated with viral controls in the elite controllers. CTL epitopes in the MHC allele exhibited properties relevant to protective cellular responses. The epitopes reside in the conserved regions of the viral proteins, therefore that mutations in the epitope sequences result in loss of replication capability or infectivity. These results suggest that in regular HIV infections, except the elite controllers, HIV evades CTL control by the emergence of escape mutants. It is generally accepted that antibodies (Abs) play an important role in host defense against microbial infections. In HIV/SIV infection, Abs against the viral spikes, in particular, those that interrupt the interaction between viral spikes and CD4 or coreceptor (CCR5 or CXCR4) to inhibit HIV infection of the susceptible cells in vitro. These are called neutralizing Abs. However, humoral response cannot control HIV infection primarily due to the diversity and variability of HIV; HIV immediately evolves to escape humoral response. These properties are considered to be the main reason for the difficulty in developing an HIV vaccine. Glycosylation of HIV underlies poor humoral response against HIV/SIV relative to other viruses. The viral spike of HIV/SIV is made of three molecules of the heterodimer of gp120 and gp41, two proteins encoded in the Env gene (see figures in the chapter Infection and Sugar Chain in Glycoword). The Env gene encodes 25-29 N-linked glycosylation sites including four sites in gp415. Therefore most of the surface of the viral spike is covered with glycans (Figs. 2A and B). As noted above, viral spikes play a crucial role in the viral entry into target cells6. HIV/SIV infect the target cells by sequential binding to CD4 and the chemokine receptor (CCR5 or CXCR4). Before binding occurs (in prefusion HIV) the viral spikes show a closed conformation with few glycan-free spaces and only one CD4 binding site available (Fig. 2A). Once the viral spike binds to CD4, the conformation of the virus spike changes and the number of glycan-free spaces increases, resulting in exposure of the coreceptor (CCR5) binding site in the trimer apex (Fig. 2B)6. Thus glycans hide the binding sites for CCR5 in the viral spikes of prefusion HIV. Binding of virus spikes to CCR5 leads to the fusion step in viral replication (Fig.1). Accordingly, glycosylation defines the interaction between HIV/SIV and target cells such as CD4+T cells. Glycosylation is the reason for the poor humoral response in HIV/SIV infection, since target sites for neutralizing antibodies (nAbs) such as the binding sites for viral receptors (CD4 or the chemokine receptor) are shielded by glycosylation. In addition, HIV/SIV exhibits extensive diversity and high viability, whereas Abs recognize specific sequence structures of the virus. As a result, Abs that inhibit the majority of HIV-1 isolates, known as broadly neutralizing antibodies (bnAbs), had been rarely isolated from infected individuals. However, since 2009 a number of bnAbs with distinct properties have been isolated7-10. They share common features distinct from conventional Abs. 1) The epitopes are localized in 6 regions shown in Fig. 2C, thus referred as major sites of vulnerability of HIV Env. 2) The genes have high levels of somatic mutations, long complementarity-determining region (CDR) H3 lengths and appropriate antibody shapes. 3) The bnAbs emerge in chronic phase with frequency correlated to viral load11. The high levels of somatic mutations reflect repeated multiple humoral responses against emergence of escape mutants12. The lengths of CDR H3 are required to penetrate the glycan shield and interact with amino acid or sugar residues in viral spikes13. Nevertheless the effects of bnAbs on control of HIV infection are weak due to the emergence of escape mutants against the bnAbs. However, the potent inhibitory effects on diverse HIV suggest bnAbs are the protective immune response induced by HIV vaccines. Since the majority of bnAbs recognize glycans as epitopes (Fig. 2C), it is important to elucidate the structure of glycans how the epitopes reside in the viral spike to create the antigens for bnAbs in order to develop HIV vaccines14. Since SIV infects and causes AIDS in macaques by a similar mechanism, the SIV/ macaque AIDS model has been used for studies to elucidate pathogenesis and for development of therapeutics and vaccines against HIV. Our group demonstrated that glycosylation defines the pathogenic properties of SIV from studies using the pathogenic molecular clone SIVmac239 and a quintuple deglycosylation mutant Δ5G (Glycoword: Infection and Sugar Chain). Δ5G replicated with kinetics similar to those of SIVmac239 during the primary infection. However, unlike SIVmac239 infection, Δ5G infection was contained in the chronic phase15. Furthermore, Δ5G elicited protective immune responses as a live-attenuated vaccine15, 16. The containment of the Δ5G infection was reasoned due to the potent NAbs elicited because of the decreased glycosylation of viral spikes. However, the assumption was denied as the levels of NAbs were varied among animals, including one in which NAbs was undetectable17. Next, since the two viruses replicated with similar viral loads, we investigated whether they infected different cells and/or tissues (Fig. 3A, B)18. 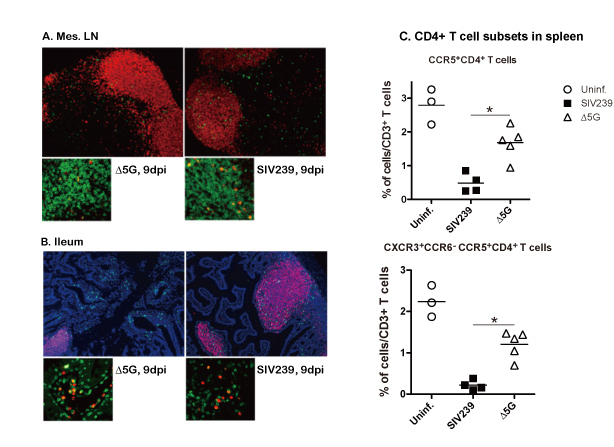 SIVmac239 were found to preferentially infect CXCR3+ CCR5+ CD4+ T cells in secondary lymphoid tissues (SLT) and depleted them to 10% of the levels of preinfection at two weeks postinfection (Fig. 3C). In contrast, Δ5G infected CD4+ T cells in lamina propria of small intestine but did not affect the levels of CXCR3+ CCR5+ CD4+ T cells in SLT (Fig. 3B). Thus, the glycosylation defined the targets of CD4+ T cell subsets and pathogenesis of the infection. Since CXCR3+ CD4+ T cells differentiate into TH1 cells that play crucial roles in cellular immunity in SLT, the depletion of the cells was the reason for the profound damage in cellular immunity. Meanwhile, lamina propria of small intestine contained differentiated TH17 cells. Thus, the Δ5G-infected TH17 cells might be utilized to induce potent adaptive immune responses. We hypothesized that the distinct primary infections between SIVmca239 and Δ5G infections were due to host responses against SIV infections. In blood, there are not only SIV and the infected cells but also immune cells that surveillance the infection and damage in tissue caused by the infection. Thus we decided to analyze transcriptomes of PBMCs from infected animals by a rhesus microarray to identify the genes involved in the host responses relevant to the differences in the infections. Since viral replication peaked at 10-12 days postinfection (dpi), we utilized PBMCs collected at 7 dpi to search for the host genes that modulated the viral replication. First we found that in both SIVmac239- and Δ5G-infected animals, a great number of Interferon Stimulated Genes (ISGs) were upregulated as compared with the uninfected animals. Genes involved in the sensing of molecular patterns in RNA such as TLR7, TLR8, DDX58, IFIH1/MAD5 were also upregulated. The expression of these genes indicates innate response to SIV infection indeed occurred. The levels of expression of these genes were higher in the SIVmac239- than Δ5G-infected animals, indicating that the difference in the expression did not explain the difference between the two viruses in control of the primary infection. Whereas a function of innate response is defense against microbes, these results indicated the main function of the innate response was the induction of inflammatory responses that direct adaptive responses. In fact, the genes for TH1 activation such as those associated with an inflammasome was upregulated more in the SIVmac239- than Δ5G-infected animals. Most notably, the genes for CXCR3 chemokines CXCL9, CXCL10 and CXCL11 that exert for homing of CXCR3+ cells to secondary lymphoid tissue were upregulated. Levels of CXCL10 were more than 10-fold higher in the SIVmac239- than in the uninfected and Δ5G-infected animals. Expression of CXCL10 was confirmed by the detection of CXCL10 in plasma by antigen ELISA. Effect of the CXCR3 ligands on CXCR3+cells was observed by significantly higher frequencies of CXCR3+ CD8+ T cells and CXCR3+ CD4+ T cells in PBMCs from the SIVmac239- than the Δ5G-infected animals. In PBMCs, CXCL10 were predominantly expressed in monocyte (Mo) subsets and DC. Among the cells, CD14+CD16+Mo expressed the highest levels and the frequency of this subset in PBMCs was the highest at 7 dpi. In secondary lymphoid tissues (SLT), CD14+macrophages expressed the highest level among the immune cells. 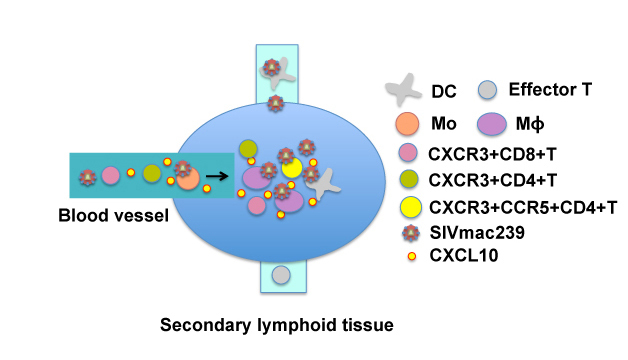 These results suggest that innate immune cells such as subsets of Mo/macrophage/DC lineage sense differences in the glycan structure of the viruses and induce innate responses including expression of CXCL10 and activation of CXCR3+ T cells, facilitating the infection of CXCR3+ CCR5+ CD4+ T cells (Fig. 4). Glycosylation of HIV/SIV utilizes the innate immune system to create a niche for target cells and helps the virus to avoid recognition by the adaptive immune system. Understanding of the structures of the glycans associated with bnAbs is essential for the development of HIV vaccines. Eradication of HIV reservoirs, that are established during the early stage of infection, and induction of protective host response are key to develop new therapies for a cure of HIV infection. We speculate that the protection of animals vaccinated with the live-attenuated, deglycosylation vaccines from a heterologous SIV challenge16 involves multiple mechanisms associated with innate and adaptive immune responses. 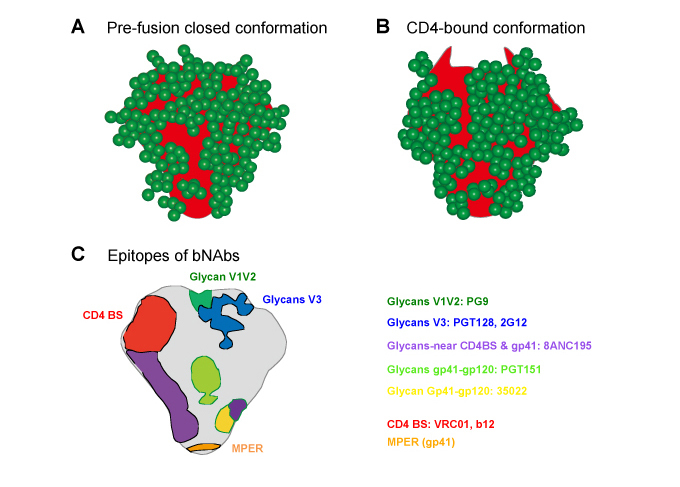 Thus elucidation of the roles and functions of glycosylation in the deglycosyated vaccines may not only provide novel insights into the pathogenesis and control of HIV infection but also contribute to progress in infectious immunology in general. 1. Passaes CP, and Sáez-Cirión A. HIV cure research: advances and prospects. Virology, 454-455: 340-352, 2014. 2. Iwasaki A, and Medzhitov R. Control of adaptive immunity by the innate immune system. Nat Immunol, 16: 343-353, 2015. 3. Takeuchi O, and Akira S. Control of adaptive immunity by the innate immune system. Cell, 140: 805-820, 2010. 5. Zhang M, Gaschen B, Blay W, Foley B, Haigwood N, Kuiken C, and Korber B. Tracking global patterns of N-linked glycosylation site variation in highly variable viral glycoproteins: HIV, SIV, and HCV envelopes and influenza hemagglutinin. Glycobiology, 14: 1229-1246, 2004. 6. Pancera M, Zhou T, Druz A, Georgiev IS, Soto C, Gorman J, Huang J, Acharya P, Chuang GY, Ofek G, Stewart-Jones GB, Stuckey J, Bailer RT, Joyce MG, Louder MK, Tumba N, Yang Y, Zhang B, Cohen MS, Haynes BF, Mascola JR, Morris L, Munro JB, Blanchard SC, Mothes W, Connors M, and Kwong PD. Structure and immune recognition of trimeric pre-fusion HIV-1 Env. Nature, 514: 455-61, 2014. 7. Scheid JF, Mouquet H, Feldhahn N, Seaman MS, Velinzon K, Pietzsch J, Ott RG, Anthony RM, Zebroski H, Hurley A, Phogat A, Chakrabarti B, Li Y, Connors M, Pereyra F, Walker BD, Wardemann H, Ho D, Wyatt RT, Mascola JR, Ravetch JV, and Nussenzweig MC. Broad diversity of neutralizing antibodies isolated from memory B cells in HIV-infected individuals. Nature, 458: 636–640, 2009. 8. Walker LM, Phogat SK, Chan-Hui PY, Wagner D, Phung P, Goss JL, Wrin T, Simek MD, Fling S, Mitcham JL, Lehrman JK, Priddy FH, Olsen OA, Frey SM, Hammond PW.Protocol G Principal Investigators, Kaminsky S, Zamb T, Moyle M, Koff WC, Poignard P, and Burton DR. Broad and potent neutralizing antibodies from an African donor reveal a new HIV-1 vaccine target. Science, 326: 285–289, 2009. 9. Wu X, Yang ZY, Li Y, Hogerkorp CM, Schief WR, Seaman MS, Zhou T, Schmidt SD, Wu L, Xu L, Longo NS, McKee K, O'Dell S, Louder MK, Wycuff DL, Feng Y, Nason M, Doria-Rose N, Connors M, Kwong PD, Roederer M, Wyatt RT, Nabel GJ, and Mascola JR. Rational design of envelope identifies broadly neutralizing human monoclonal antibodies to HIV-1. Science, 329: 856-8061, 2010. 10. Huang J, Ofek G, Laub L, Louder MK, Doria-Rose NA, Longo NS, Imamichi H, Bailer RT, Chakrabarti B, Sharma SK, Alam SM, Wang T, Yang Y, Zhang B, Migueles SA, Wyatt R, Haynes BF, Kwong PD, Mascola JR, and Connors M. Broad and potent neutralization of HIV-1 by a gp41-specific human antibody. Nature, 491: 406–412, 2012. 11. Moore PL, Williamson C, and Morris L. Virological features associated with the development of broadly neutralizing antibodies to HIV-1. Trends Microbiol, 23: 204-211, 2015. 12. Klein F, Diskin R, Scheid JF, Gaebler C, Mouquet H, Georgiev IS, Pancera M, Zhou T, Incesu RB, Fu BZ, Gnanapragasam PN, Oliveira TY, Seaman MS, Kwong PD, Bjorkman PJ, and Nussenzweig MC. Somatic mutations of the immunoglobulin framework are generally required for broad and potent HIV-1 neutralization. Cell, 153: 126-138, 2013. 13. Garces F, Sok D, Kong L, McBride R, Kim HJ, Saye-Francisco KF, Julien JP, Hua Y, Cupo A, Moore JP, Paulson JC, Ward AB, Burton DR, and Wilson IA. Structural evolution of glycan recognition by a family of potent HIV antibodies. Cell, 159: 69-79, 2014. 14. Burton DR, Ahmed R, Barouch DH, Butera ST, Crotty S, Godzik A, Kaufmann DE, McElrath MJ, Nussenzweig MC, Pulendran B, Scanlan CN, Schief WR, Silvestri G, Streeck H, Walker BD, Walker LM, Ward AB, Wilson IA, and Wyatt R. A blueprint for HIV vaccine discovery. Cell Host Microbe, 12: 396-407, 2012. 15. Mori K, Yasutomi Y, Ohgimoto S, Nakasone T, Takamura T, Shioda T, and Nagai Y. A quintuple deglycosylated mutant of SIV in rhesus macaques; Quintuple deglycosylation mutant of simian immunodeficiency virus SIVmac239 in rhesus macaques: robust primary replication, tightly contained chronic infection, and elicitation of potent immunity against the parental wild-type strain. J. Virol. 75: 4023-4028, 2001. 16. Sugimoto C, Watanabe S, Naruse T, Kajiwara E, Shiino T, Umano N, Ueda K, Sato H, Ohgimoto S, Hirsch V, Villinger F, Ansari AA, Kimura A, Miyazawa M, Suzuki Y, Yamamoto N, Nagai Y, and Mori K. Protection of macaques with diverse MHC genotypes against a heterologous SIV by vaccination with a deglycosylated live-attenuated SIV. PLoS One. 5: e11678, 2010. 17. Sugimoto C, Nakayama EE, Shioda T, Villinger F, Ansari AA, Yamamoto N, Suzuki Y, Nagai Y. and Mori K. Impact of glycosylation on antigenicity of simian immunodeficiency virus SIV239. Induction of rapid V1/V2 specific non-neutralizing antibody and delayed neutralizing antibody following infection with an attenuated deglycosylated Mutant. J. Gen. Virol. 89: 554-566, 2008. 18. Sugimoto C, Nakamura S, Hagen SI, Tsunetsugu-Yokota Y, Villinger F, Ansari AA, Suzuki Y, Yamamoto N, Nagai Y, Picker LJ, and Mori K. Glycosylation of simian immunodeficiency virus influences immune-tissue targeting during primary infection, leading to immunodeficiency or viral control. J. Virol. 86: 9323-9336. 2012.